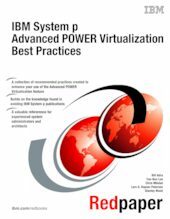 This IBM Redpaper provides best practices for planning, installing, maintaining, and operating the functions available using the Advanced POWER Virtualization feature on IBM System p5 servers. This Redpaper can be read from start to finish, but it is meant to be read as a notebook where you access the topics that pertain best to you. This paper begins where Advanced POWER Virtualization on IBM System p5, SG24-7940, ends by adding additional samples and scenarios harvested by a select team that works at client and outsourcing sites, running both small and large installations. The experiences contained within are select best practices from real-life experience. A working understanding of the Advanced POWER Virtualization feature and logical partitioning and IBM AIX 5L is required, as well as a basic understanding of network and VLAN tagging. Note: Advanced POWER Virtualization is now a set of editions available under the PowerVM brand. This paper applies applies to the basic tecnologies that are common with the new and old naming.